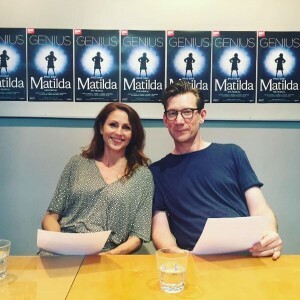 Last week, we caught up The Wormwoods, Michael Begley and Rebecca Thornhill, to ask them all of our social media fan questions. Keep reading to discover their stage mishaps and what they love most about performing in Matilda The Musical. Do you still feel excited to put your wig on, do your make up and perform as you did for the first few shows? Rebecca Thornhill: I do feel excited actually, without the wigs, costume and make up, Mrs Wormwood doesn’t really arrive. For me that makes my character. Do you ever feel that your characters are being so mean that you need to apologise to the girls playing Matilda? And what do you do off-stage to maintain a positive relationship with them? Rebecca: I make faces, before I go on I usually do the duck face, that’s quite nice. Michael Begley: We all get on really well, we see quite a lot of each other backstage. They’re all very different. I can’t imagine any of them holding anything against us. Rebecca: I think in the beginning we were nasty to them in rehearsals, they would usually get to the end and then giggle. Michael: I think they quite like it actually, they get quite thrilled with it. If you could cast the Wormwoods in another musical, what would you cast them in and why? Rebecca: I suppose the easiest option I would go for is Les Miserables, the Thenardiers. I think we’d make nice Thenardiers; that would actually work. Michael: The Bodyguard, that’s how I see myself. But I’m quite frail so you’d have to carry me at one point, that’s the image I have in my head. I can see you doing the Whitney thing, and I’m quite leading man material I think. Rebecca: In that case I’d be in Strictly Ballroom, she’d wipe the floor with them! What’s the weirdest thing that’s ever happened to you on stage in Matilda? Michael: Probably the most disgusting thing was when I spat all over Clara the other day, and what really impressed me was that she didn’t do anything. She didn’t move, most people would go “eugh” but she just stood and looked at me. I said “thick headed twit brain” really quickly using my diction and I just sprayed! Things like that happen quite a lot, I spit on you quite a lot don’t I? Rebecca: Yeh I try to ignore it! The other day, on the bottom of my heel I have a little piece of plastic that protects the bottom of the heel, they’re massive stilettos, and because there’s lots of tracks in the floor, it’s to stop them going down the track. I obviously found a gap where I could get down the trap and my heel went down and stayed there. It was in his scene so I was trying not to pull focus, and I was thinking I actually can’t move! So half way through I had to bend down and yank my heel out of the gap, and then because the plastic had stayed in the groove, I went down the next hole! Michael: Occasionally little things like that do happen don’t they and you just have to kind of get on with it! Rebecca, how long did it take to perfect the “Loud” routine? Rebecca: I’m still going on that one! I don’t know if it will ever land to perfection because it’s so tricky, there’s always something that goes slightly array. I’m a bit of a perfectionist so every night I will be like “right I’m going to get this bit right” and then something else will go. Michael: What is it like doing “Loud”? Rebecca: It’s like a 3 minute shock, like an electric shock. It’s just so fast, so much energy, so much effort and fun. It’s just everything, it’s really great. I think if it settled it would be wrong because it’s supposed to be “oh and this”, “oh and that”, so it should always be quite fresh. Michael: No I don’t, I used to sing in old people’s homes and to be quite honest with you after that it’s all downhill! Rebecca: I get nervous occasionally, but I think you always need to have a certain amount of nerves just at the bottom, just in case. I think if you get too relaxed you just go out there and talk. Michael: That’s when the trouble starts isn’t it, I agree with that. I get excited, does that count? Michael, your character scams and deceits people for a living, what is the best scam you’ve ever pulled on someone? What is it like to be able to bring this classic story to life every night? Michael: I’m going to answer this one seriously, it is wonderful. It is amazing really because there’s a sense of excitement with a lot of the people who come, you can just tell that they’ve waited years to see this story. They are expecting one of the best bits of theatre they’ve ever seen and the real, amazing thing is a lot of them don’t go away disappointed. You can’t really get bored with that. Bit in terms of the story, it is just a cracking tale really, and I think we probably play two of the most fun characters to play. I love it! Rebecca: I love it too, and also the good thing is when they come to see it, they’ve read the book and then they get the songs. Michael: And there’s so many surprises that aren’t in the book or the film. Of all the scenes to choose from, which extra scene would you like to be in? Rebecca: There’s so many! I’d like to be in the gym section, Phys Ed, I’d like to throw myself around! I’d like to be in revolting children because it’s the best number ever and I want to swing my jacket around my head. We don’t get to go on the swings, I’d like to get a go on them too! What were your auditions like? Rebecca: Pretty full on, there was quite a lot of them actually. I flew back from Dublin twice. It was putting the layers on, so you’d get the dancing first then you go on a couple more auditions and then go back to it. I think the most terrifying one was the very last one because it was an entire row of people behind these tables and a camera in the middle, so that was quite terrifying. I thought my last audition was terrible, I thought that was it. Michael: Mine were a bit like that as well, I went 3 times. The first time there was 6 people behind the table, I had to sing Telly with Joe who is our amazing associate director, he actually gets on his knees to be Matilda, he’s a cracking Matilda! The next time I went back I did the same scene, the same song and it was just a man on the piano and 9 people behind the table. Then the last time, like Rebecca was saying it was the longest table in the world, it was all a bit full on really. I remember going in and everyone else was sat down and I remember going in and saying “don’t stand up”. Michael: That’s how I got it? Well there you go! Other than Matilda what is your favourite Roald Dahl book? Michael: Me personally, it’s got to be “Charlie and the Chocolate Factory” because it was the first book I ever read. I’ve also got a real soft spot for “Danny, the Champion of the World” only because I read it to my son and I really recommend that to any parents, it’s a beautiful book. Rebecca: “Charlie and the Chocolate Factory” would be my favourite one but mainly from the film rather than the book. I’d like to see The BFG film that’s just come out. If you could play a different character in Matilda, which one would you choose and why? Rebecca: I’d love to play Trunch, because it’s just the best, without a doubt! Michael: Mine is the same answer, but it’s qualified by the fact that I share a dressing room with the actor who plays Trunch so I see what he goes through every night, and believe me on hot days it’s just minging! I would maybe like to do it once with an air conditioned costume! What advice would you give to people wanting to start out in Theatre? Rebecca: I would always say stay true to who you are because you as a person is the most interesting thing that you bring to the room. If you try to put on airs and graces, it’s not you, it’s not true. Michael: I remember we went for a coffee really early on when we were getting to know each other and you said something to me which I have never forgotten which was that when you were starting out and training, it wasn’t obvious to you or anybody else, which really surprised me because I would’ve thought that you would be obviously brilliant at everything. You said that that wasn’t the case and that you were just a grafter and worked really, really hard. Are you anything like your characters in real life? Michael: We hope not! I’m a real bookworm, I like books. But I do really like Telly! I’m like him in that sense, but that’s about it I think. If you had to read a book, what book would it be? Michael: If I was answering as myself, it would probably be some theology from the 12th Century, that’s what I like to read just for my down time, just for fun! But if it was Mr Wormwood it would probably be something like “Cars and how to scam them”. Rebecca: Well I wouldn’t read anyway as Mrs Wormwood, she just likes pictures. If I had to read a book, my favourite book is “East of Eden” by John Steinbeck. If you could play a child character in the show, who would you play and why? Rebecca: Lavender, she’s nuts! So excited! And she gets to put the newt in the jug. Michael, how difficult is it to perform a song as lyrically challenging as “Telly”? Michael: It’s tricky! Especially if you’ve got a cold because you can’t ever breathe in because your mouth’s so busy with the lyrics. And it depends on the Musical Director, sometimes they do play it very, very fast! What’s the best thing about playing Mr and Mrs Wormwood? Rebecca: All of it! Being nasty and getting away with it I guess, that’s a terrible thing to say isn’t it! Michael: But it is though isn’t it! There’s something about it which is very liberating, it’s like some weird therapy! I also love it when we’re in our costumes, it’s like play time. You could put us in those costumes anywhere and it just becomes wonderful.